Clement held that, within God’s created order, understanding is from God, and many things in life arise from the exercise of human reason, although its ­kindling spark comes from God. 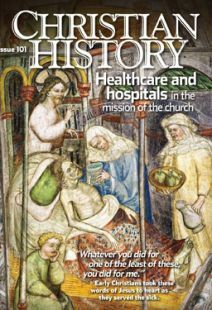 Health obtained through medicine is one of these things that has its origin and existence as a consequence of divine Providence as well as human cooperation. . . .
By the Middle Ages, long-term residents of hospitals received clothes, in many cases a uniform with a distinctive badge. Black, white, dark brown, blue, and gray were popular uniform colors. Badges might consist of crosses or of an image related to the patron saint of the hospital or to the name or heraldic device of its founder. Distinct styles of uniform might also be worn by staff to distinguish them from patients. Finally, uniforms could prove helpful in keeping tabs on hospital residents in cases where they were allowed to leave the hospital (if, for example, they were not violently ill, or if they were poor or elderly but not infirm). The priory of St. Mary of Bethlehem in London was founded in 1247 and specialized in mental illness. Its name in colloquial speech was pronounced “Bedlam,” and it became notorious in later years for its sub­standard treatment of patients (which included allowing the public in to look at them for a small admission fee). Its notoriety eventually gave a general word for “chaos” and “uproar” to the English language. Anthony (251–356) for “St. Anthony’s fire,” which meant ergotism or erysipelas. The disease got its name when, around 1095, the son of the nobleman Gaston of Valloire was cured from it by the relics of St. Anthony the Great in the church of St. Anthony at La-Motte-Saint-Didie. In gratitude, Gaston and his son founded the lay order of the Hospital Brothers of St. Anthony to care for pilgrims to the shrine at the church and for the sick, especially those with St. Anthony’s fire. Roche or Roch (1295?–1370) for plague. He was supposedly born with a cross marked on his chest and as an adult cured many plague sufferers with the sign of the cross. A cessation of plague in Constance after his death was associated with prayers and processions that were ordered in his honor. Blaise (d. 316?) for throat diseases. One of the legends of St. Blaise tells of him curing a boy who was choking because of a fishbone in his throat. Lawrence (d. 258) for backache. St. Lawrence was martyred by being roasted on a gridiron. Bernadine (1380–1444) for lungs. St. Bernadine was a famous and powerful preacher. Vitus (fourth century?) for St. Vitus’s dance, or chorea. St. Vitus was supposedly a young boy whose father tortured him to make him renounce the faith, and since St. Vitus’s dance affects children, an association may have sprung up. Apollonia (d. 248–249) for toothache; she was a virgin martyr who was killed by having all her teeth removed. Margaret of Antioch (fourth century?) for women in labor. St. Margaret was martyred both for her refusal to renounce Christianity and for her refusal to submit to the advances of a Roman bureaucrat. In the later Middle Ages some new saints became popular patrons for the sick, and hospital chapels were also dedicated to them; these included Anne (grandmother of ­Jesus), Ursula (a legendary virgin martyr), and Elizabeth of Hungary (see “The charitable revolution,” p. 33).